Jane Hirshfield writes that to read a haiku is to become its coauthor, to place yourself inside its words until they reveal one of the …shapes of your own life. If the listener/reader can do that, can settle with those few words of a haiku, listen to them, curl them around in her mind, live with them for longer than a few seconds, climb inside them, consider their flavours, then the poem may begin to affect a life the way a great piece of music does. Haibun offers the chance to do that, but also to understand how the prose is affected by the haiku, how the two parts reflect off each other, changing the meaning of each part, or enriching it, backwards and forwards. When either part is unusual for one reason or another, we get to think about that, about why the writer put those two parts together, decide whether the pairings work, and why or why not. When a respected poet does something outrageous, we accept that something completely new is in the making. When in Drifting (2014, catkin press) Marco Fraticelli set out to create haibun from a ragged set of papers, bills and journals, written by an unknown woman in the early 1900s, he did exactly that. He got to know Celesta Taylor so well, first by reading every scrap she left in that abandoned cabin, and then by paring her words down to the few that best told her story. It is as if he became Celesta, until her story began to merge with his own life, until she and he were ready to coauthor the haibun in Drifting. Henry gave me this diary/ an old one of his/ so I like it better than new. (November 6, 1910), a haiku he has created from her own words. Celesta’s diary begins in 1905 when she writes about her teenage sons away at school, about going to the doctor about her arm, and reporting that the mill caught fire. The mill belonged to the man and his daughter that she was housekeeping for. Each of these entries a month apart were marked with a mysterious ‘X’. Half the world’s population will get this right away. December 18, 1905: Henry’s surgical operation. December 20, 1905: Henry sat up a few minutes. December 21, 1905: Grandpa died. Using found material in any poetry can be risky. Yet in Drifting, Celesta Taylor becomes real, and her story mesmerizing, for these are her own words, her own experience, her own feelings, and her lover’s ultimate betrayal. Drifting is a collaboration happening across a century. 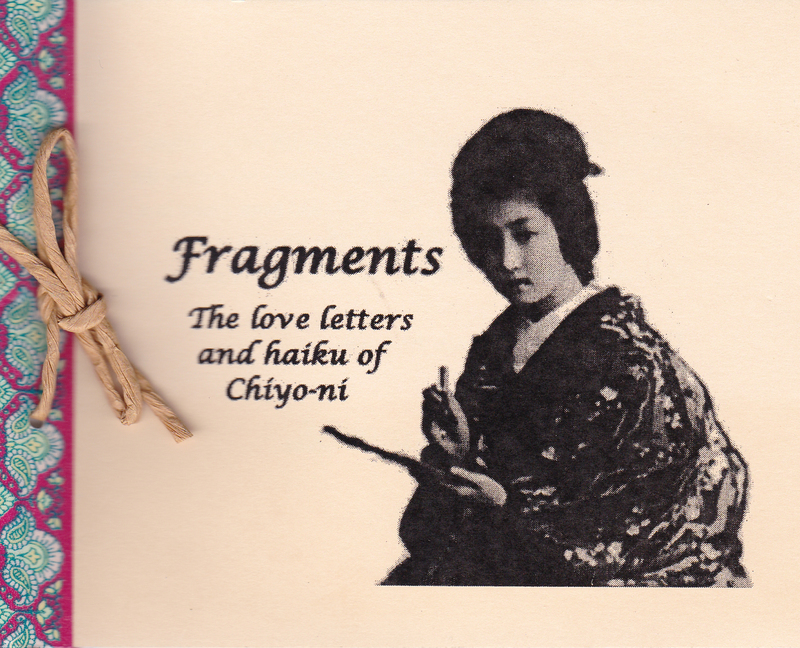 In his further investigations in using haibun, Fraticelli has put together a small chapbook of selections from Fragments, a work in progress. I can’t imagine that I will actually ever send these letters to you. It is more likely that they will be found under my pillow one morning when I do not return from my final dream of you. Recreating a poet from made-up letters, now that is amazing, Mr. Fraticelli. Terry Ann Carter of Victoria, B.C., is writing haibun from another unusual perspective. For a long time she has been in awe of the set of woodcut prints known as The Fifty-Three Stations of the Tokaido, for which Hiroshige (1797 – 1858) painted the originals. Widely recognised as one of the true greats of ukiyo-e art, Hiroshige was a prolific artist who specialised in painting landscapes and adopting Western techniques such as perspective. Hiroshige was not a printmaker. He painted the pictures which were then used as guides to be pasted onto woodblocks by the woodblock carver and his apprentices. One block was needed for each colour, and sometimes as many as twenty or thirty blocks were needed. A carver would train for over twenty years before he was allowed to touch the finer parts of a block. Then the blocks were off to the printers. Each finished print was the outcome of registering each of the many carved blocks over the previously printed colour so that the lines and colours fell in exactly the right place. It was a complicated system of keeping the papers damp, and having highly developed complex colour and printing skills, knowing about changes in pressure, in the brushing, variations in the proportion of pigment to paste, in the way the pigment pools subtlely at the edge of the printed shapes, in the types of brushes used. Hiroshige had the easy part, though he is the one who gets credit for the prints, just as Picasso did. The Tokaido was one of several important roads constructed by the Shoguns to increase their control over the country. 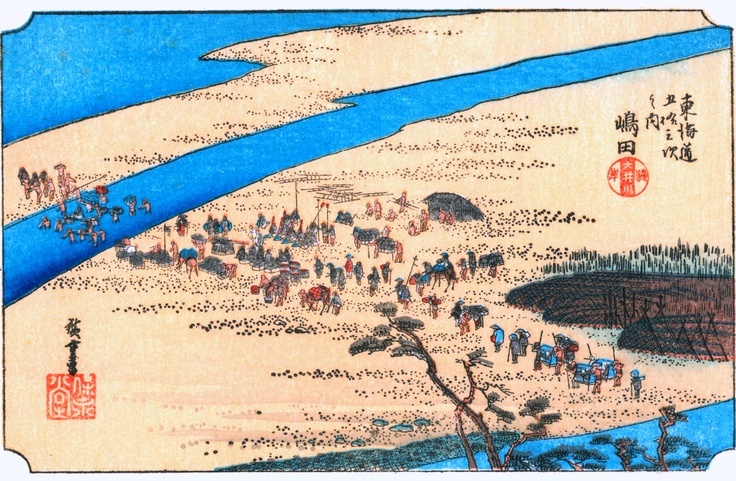 In 1832 Hiroshige made the trip to Kyoto as part of a delegation sent on behalf of the Shogun. Upon his arrival back in Edo he immediately began work on a series of prints that would become known as The Fifty-Three Stations of the Tokaido. All that to explain the fascination of the prints from an artistic point of view. Ms. Carter sees this side of the prints, and has envisioned Hiroshige as he walks the Tokaido, putting herself into the mind of the painter, but linking it to her own world. We shift from 1832 Japan to 2015 Canada in these poems. Although Hiroshige was looking and sketching landscape, he could not escape his own concerns, such as how to survive as an artist and maintain his own political integrity. You always said try holding it together for a change. But I’m battling depression. My body a tripod with the help of a walking stick. A hiking manual deleting the part about shallow water. Your answer to everything…elliptical. A poet writes about being a kid. Seeing his neighbour drown a sack of kittens one cold November night. That river too wide to cross. Does anyone listen to Little Walter anymore? My eye surgeon cutting into the heart of me. All that I see. My father crossing North Africa. 1943. Rommel on the run. These trajectories at the lookout, north of Black Mountain College. On the North Carolina switchback they call Blue Ridge. I once was at a weekend workshop in Connecticut with Jane Hirshfield and Robert Bly. The simplicity and honesty in their approach to poetry was remarkable. My respect for what she writes tripled, and it was mighty to begin with. She writes: To plunge one thing into the shape or nature of another is a fundamental gesture of creative insight, part of how we make for ourselves a world more expansive, deft, fertile, and startling in richness. Here we have seen Terry ann Carter and Marco Fraticelli ‘plunging’ into the lives of others, creating, through ‘sympathetic magic’, opportunities for the rest of us to experience those lost rich worlds. Neat, I’d love to see those Hiroshige haibun. Claudia, such a wonderful blog today. You bring an artistic and poetic view to this subject of haibun. It is always so appreciated when a reader “gets” what one is trying to do. The beautiful illustrations add to your depth of scholarship. I am very moved by these words.